Honey bee on approach to land on a Calandrinia. Nikon D800E, Sigma 180mm f/3.5 EX APO Macro HSM lens, single Nikon SB-R200 flash @ 1:8 power with diffuser, handheld, 1/250th sec, f8. ISO 500. Handheld macro photography in the field can be one of the most fun and rewarding ways to photograph nature. The required equipment setup can be simple and lightweight and easy to use and does not have to heavy, overly complicated and cost an arm and a leg. Over the next couple of weeks I will cover my favorite close-up tips and techniques in multiple parts; macro flash basics, my recommended equipment, and finally field techniques. I hope this will inspire and motivate you to get out in the field and give close up photography a try, especially my favorite, hand held macro flash photography. I prefer to shoot handheld and with flash when doing macro photography. Using flash allows you to attain sharp results even in breezy conditions without the use a tripod. In fact using flash means you can photograph in all kinds of less than satisfactory situations like midday sun, dark cloudy skies, or even at shooting at night with good results. Flash can record and reveal an amazing amount of detail and sharpness in the field that would be difficult or impossible to attain even with a tripod. For an idea of what kind of sharpness you can expect look at the example directly below then look at the image below that made at a 100% view or 100% crop of the very same image below at the actual pixel level in Photoshop, Menu > View > Actual Pixels. Note that these images were made with a Nikon D800E. Nikon D800E, Sigma 180mm f/3.5 EX APO Macro HSM lens, single Nikon SB-R200 flash @ 1:8 power with diffuser, handheld, 1/250th sec, f8. ISO 200. Take a look at the full frame daisy image above, then look at the same image below cropped at 100% view to show you the amount of detail present in the same image above. This kind of detail is impressive but when you consider that the image was made handheld at close to life-size magnification with a 180mm telephoto lens without a tripod it is almost unbelievable. Handheld close-up photography gives you freedom and speed that is just not possible when using a tripod. You can shoot at different angles and perspectives freely without the need to constantly adjust a tripod. 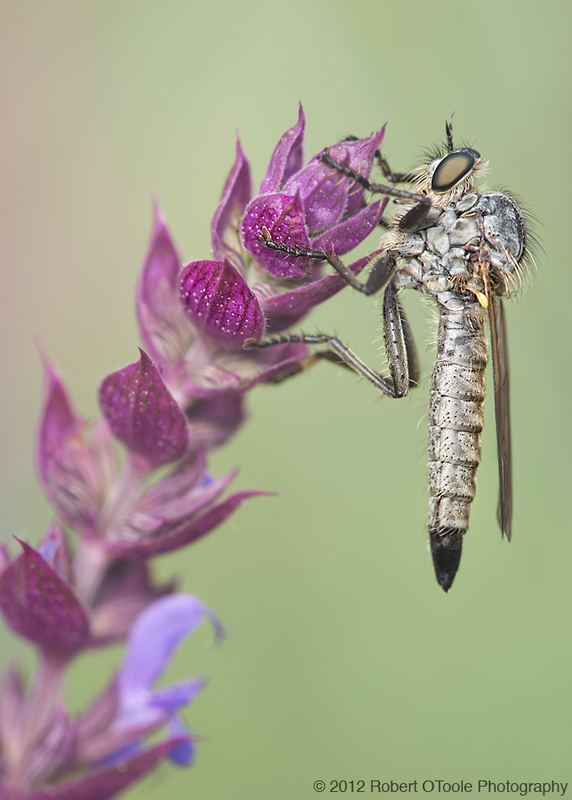 Even more importantly shooting handheld makes shooting small fast moving objects possible and even fun, like this Robber fly image below. Almost any flash will work well for close up but remember to always place the flash as close to the subject as possible for the best light quality, and always use of a flash diffuser for softer lighting. Choose a flash that allows you the capability to control the output with manual control or exposure compensation. Low size and weight are very important considerations when choosing a flash for hand held use. If you have trouble holding the camera steady, monopods are fast enough to use for close up work without all the bulk and weight of a tripod. 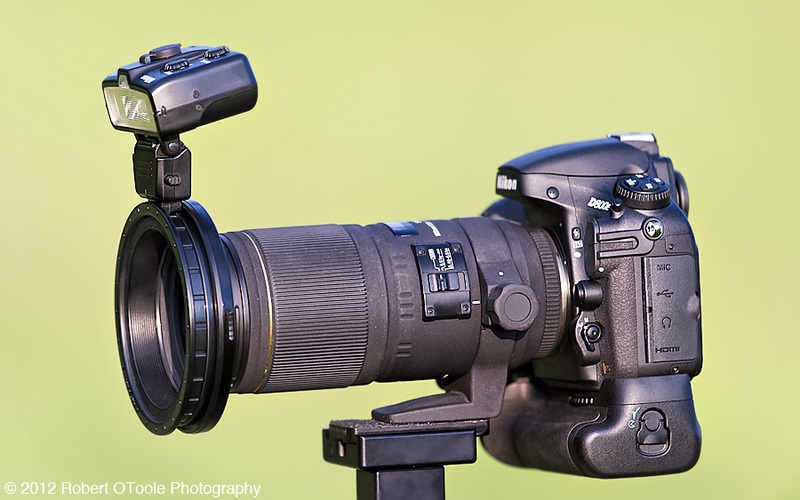 Considering a ring flash or dual flash set up from Canon or Nikon? This type of system is really suited for scientific applications. They are heavy, expensive and a little large to have to carry for long hours in the field. A single small flash is all you need for good results in the field. The downsides to a macro flash set up is most of all the initial cost then there is the extra weight and extra set up time. The macro flash set up does not have to be expensive, my current Nikon set us was less than $250. I will post a complete breakdown and description of my macro equipment in a few days but this image will give you a good idea of what the system looks like. At the front you have a single Nikon SB-R200 attached to a Nikon XS-1 adapter ring mounted to a Sigma 180mm macro lens mounted on a Nikon D800E, simple, fast and deadly sharp. After shooting macro with Canon DSLRs for about 7 years and Nikon for the past 5, I have to say the set up as seen below is about as close to macro gear perfection as you can get, super sharp, light, quick, responsive and wireless. Nothing can come close to matching this set up in terms of portability, reach, resolving power and it is all available off the shelf for a a very low price, that is if you find a D800 or D800E in stock that is. You do not have to use the same equipment as I do, a shorter macro lens and an older body would work very well. For this image I removed the flash diffuser so you could get a good look at the flash. I use this system handheld about 90% of the time. Also the D800E flash is down but it would be up during normal use in the field.